I have been looking forward to writing this post for over a month, but in the effort to keep a Christmas secret, I’ve held out until now. 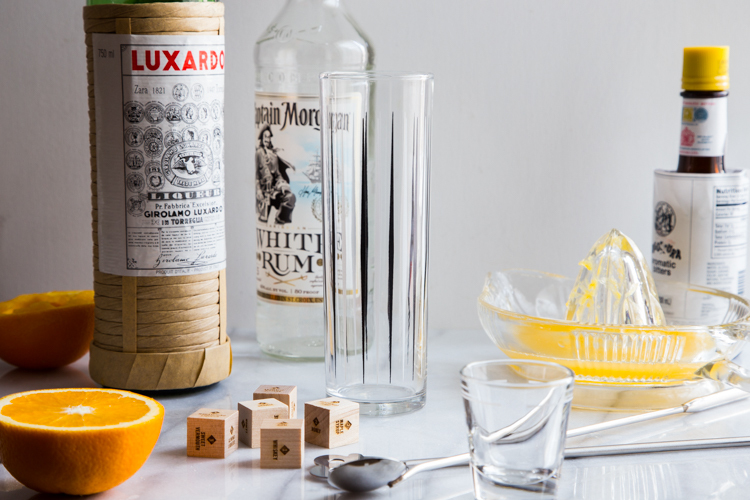 But I can promise you this – you are going to love both this Rum Orange Swizzle and my new favorite cocktail making tool: Mixology Dice. 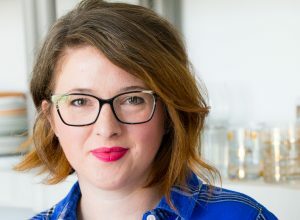 Back in November, my friend Jenni mentioned Foodie Dice on Instagram and I was so intrigued that I started google stalking like nobody’s business. I clearly have attention problems when poking around online but that’s an issue for another day. 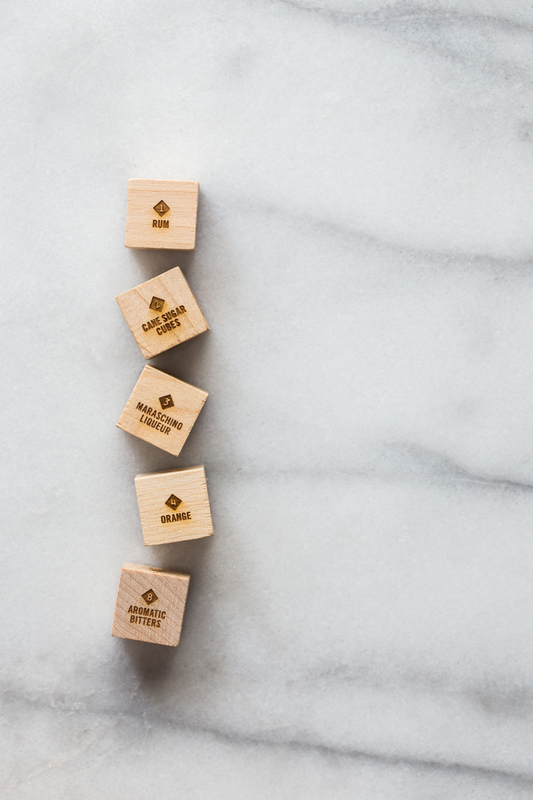 So, it turns out that Foodie Dice were created by the incredibly imaginative Two Tumbleweeds brand to help you create unique and interesting dinners by rolling a set of dice. 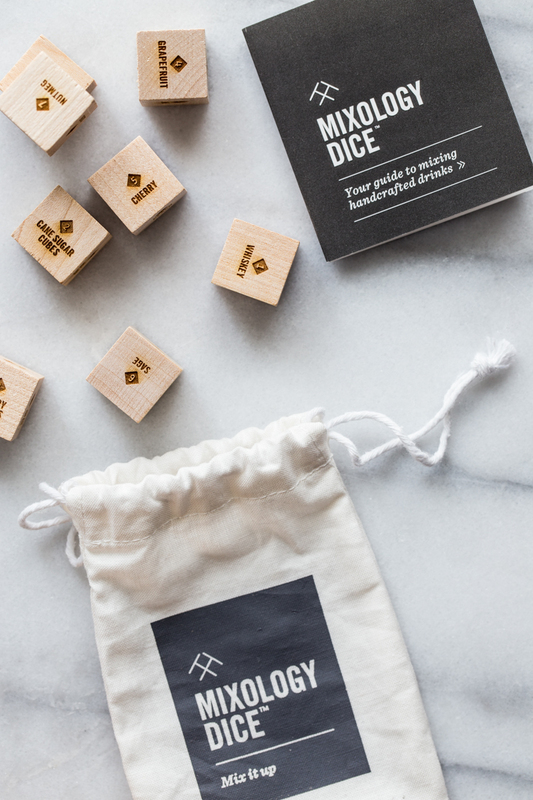 Amidst my poking about on their site, I saw that they had recently come out with a Mixology Dice set that does the same thing with cocktails. I was sold. I ordered a set for my husband for Christmas knowing he would love playing around with exciting combinations of flavors and ingredients. Basically, the dice come with a set of instructions that break cocktails down into 8 main types of drinks. Depending on which type of drink you want to make, you roll the corresponding dice in the instructions. 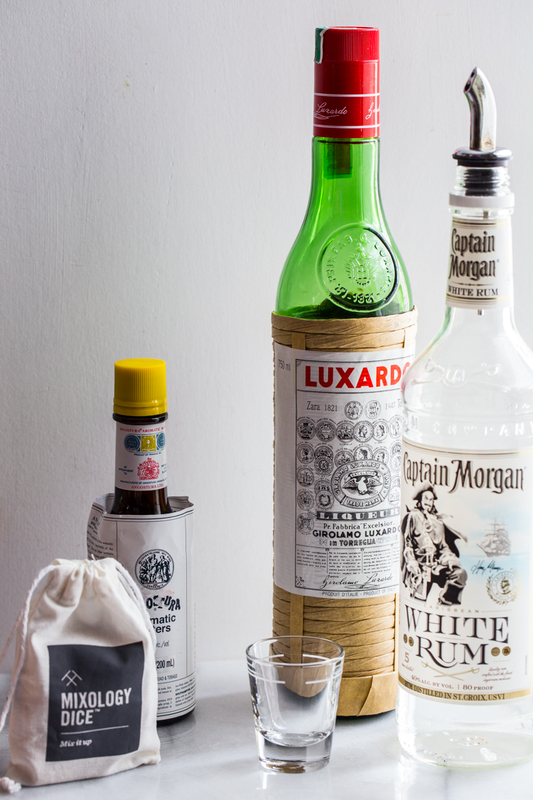 Then, you create the drink using the ingredients that turned up on the dice. Totally fun! Well, last weekend we broke them out and decided to make Swizzles. We both rolled our own combinations and the drinks turned out totally unique from each other. My roll turned up whiskey, jam/preserves, almond liqueur, tangerine and aromatic bitters. My husband’s roll was rum, cane sugar cubes, maraschino liqueur, orange and aromatic bitters. We made them both and was blown away at how different they were, but also how delicious they were! 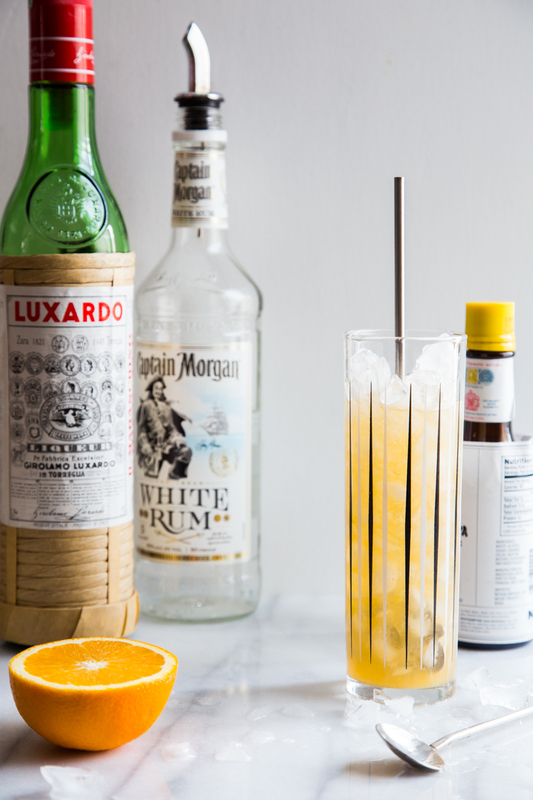 I wanted to recreate one for today’s cocktail and decided on my husband’s rum orange version. We’ve used maraschino liqueur before in our Aviation cocktail and was excited to see it turn up in this roll. 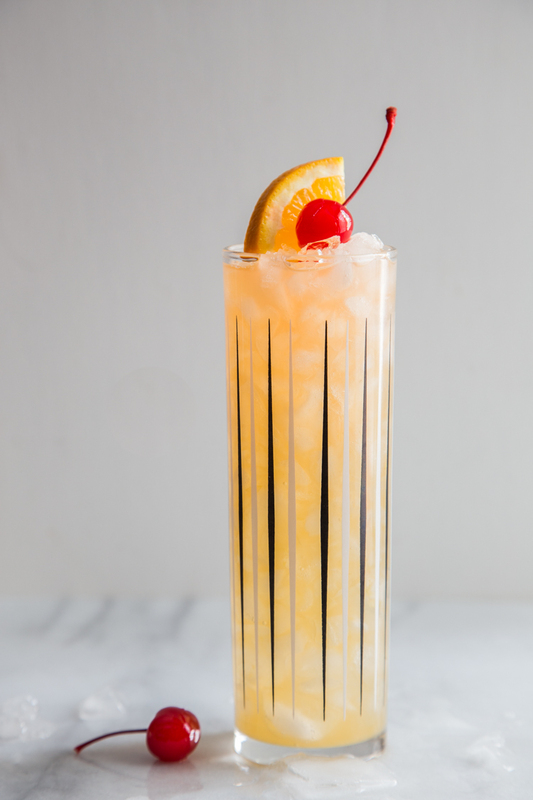 I had never made a swizzle before and this video by Two Tumbleweeds does a great job in showing the proper way to build a swizzle (which isn’t difficult, I promise). It turns out that we actually had the little swizzle stick thing that mixes the drink up and gets the glass nice and frosty. It was one of the pieces of our barware set that I never knew it’s purpose. Turns out it’s super cool and hand to have, especially now that we’re making swizzles. I think I just like to say swizzle. You build the drink in a collins glass, or any tall skinny-ish glass you have. Mix it well with a bar spoon before adding a bunch of crushed ice. After the crushed ice, pop the swizzle stick in and twirl between your palms until the drink is nicely mixed and the glass is frosty. 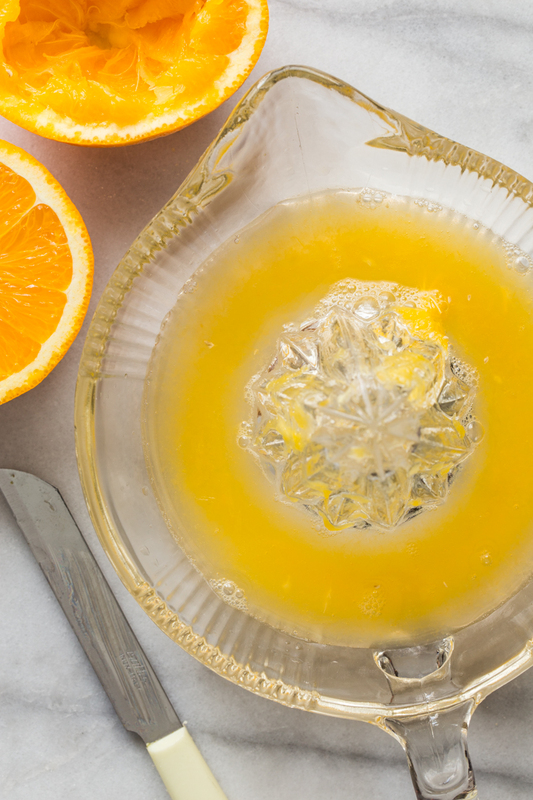 Top it with a bit more crushed ice, a wedge of orange and a maraschino cherry on top. Boom, Swizzle. You should definitely give this cocktail a try, and if you’re as into crafting unique drinks as we are, be sure to check out these Mixology Dice. They are so much fun! 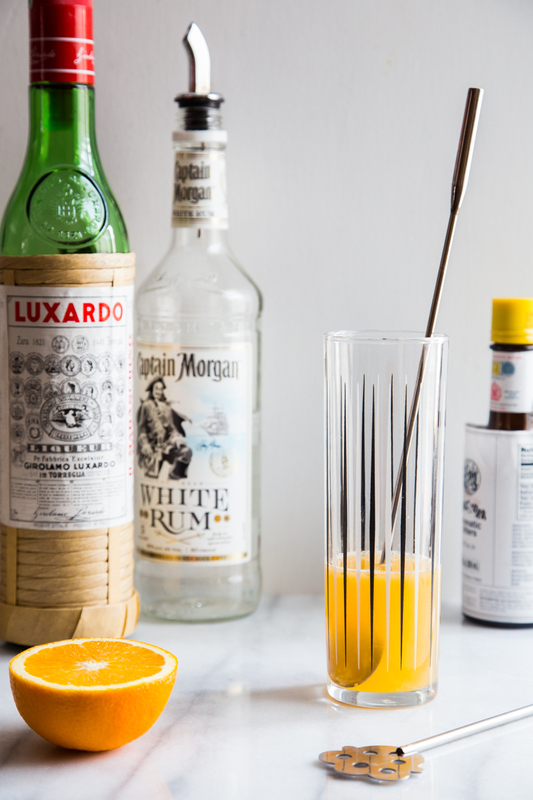 Add rum, orange juice, sugar cube and maraschino liqueur to a collins glass. Stir with a bar spoon until sugar cube is dissolved. Fill glass with crushed ice and 'swizzle' using a swizzle stick or bar spoon until cocktail is fully mixed and glass is frosty. 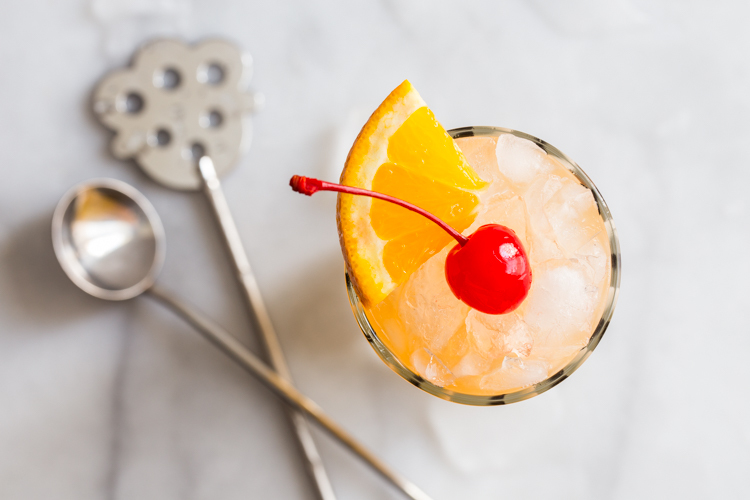 Garnish with orange wedge and maraschino cherry. Serve! This looks so delicious! Just the name makes me really want to try it. What gorgeous photos! Looks delicious too! Thank you so much, Millie! I saw those dice in Bon Appetit and I’ve been dying to purchase them. Thanks for the reminder! Oh, and this drink looks heavenly. Thank you, Annalise! They are so much fun! I am getting ready to order the Foodie Dice set, too. Dinner is about to get so much more exciting! Such stunning photos, I just love this! Love this! Can someone tell me the name of the tall glass with the black strips or where I can buy it? Thanks! !